The only electric tomato slicer in the industry. 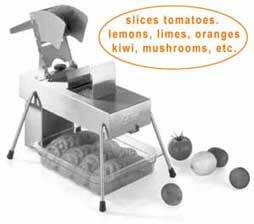 This outstanding tomato slicer also slices soft fruits and vegetables...Fast!. Clean and uniform slices every time, even with overripe, soft tomatoes. Comes complete with stainless steel wash guard for safe cleaning of blade assembly. Available in 3/16�, 1/4�, 3/8�. Includes 2 Slice Blade assemblies with Wash Guard.